When you join Kal Tire, you have the chance to do something big with your career: chase goals, grow and give back to the community the same way we have for more than 60 years. As part of the Kal Tire family, you’ll see how our unique culture of teamwork and true service set us apart, and set you up for success. Along the way, we’ll make sure you’re fulfilled and challenged with ongoing training, mentorship, rewards and global opportunities as part of your Best Career. At Kal Tire, we recognize how important career advancement is to our team members. We believe our people are the key to our success. With this in mind, we have embraced a culture of learning which allows you to participate in many great training and learning opportunities to lead you to your best career. Your ‘been-there, done-that’ mentor will provide you with great tips and work with you to set goals for your career. More than 1,600 online courses will provide you the tools needed to get the job done right. Travel to Vernon, BC, to visit our career campus. 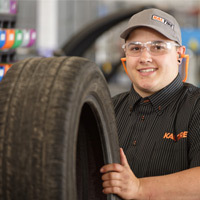 Our classroom training provides you with fantastic tips, techniques, tricks and insight into your career at Kal Tire. Harvard Mentor Management Partnering with Harvard Business Review Publishing, this program provides great learning opportunities to becoming a highly effective leader at Kal Tire. The Leadership Challenge This program gives team members the tools to understand the five practices of exemplary leadership and use them to cultivate their own leadership potential. 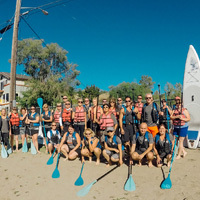 McQuaig Teaches team members how to hire, coach and develop talent in the most effective way, based on a team member/ candidate’s behavioural assessment. Dale Carnegie This learning program helps develop leadership abilities by giving team members the tools and practice to improve communication skills, interpersonal relationships and manage stressful work conditions. When Kal Tire opened in Vernon, BC, in 1953, the term ‘corporate social responsibility’ hadn’t yet been coined. And yet doing the right thing—for our team members, our environment and our communities—has always been a part of what we do at Kal Tire. Our aim is to earn the trust of our customers by providing them with a level of quality and value of both service and products that exceeds their expectations and exceeds that available from the competition. Our aim is that the career of every team member is supported by quality leadership, training, and opportunities for advancement. Our people will work safely and have the ambition, enthusiasm, and energy to be productive, efficient, and contribute to an upbeat atmosphere in the workplace. Our aim is to achieve a fair profit in all of our operations. Our aim is to expand our company in a deliberate and balanced fashion for the purpose of strengthening our ability to serve the customer and provide a solid future for our people. However, our rate of expansion will not be beyond our ability to finance or manage to a consistent standard of quality. Our aim is to conduct ourselves with honesty and integrity, being conscious of our image and with modest respect for our successes. Our image is defined by the conduct of each of us. Our aim is to build long-term relationships with our suppliers based on competitiveness, value and mutual respect of objectives. Our aim is to continually improve every aspect of our company, recognizing our responsibility to our customers, each other, our communities and the environment. From discounts on tire purchases to a retiree VIP program, Kal Tire has you covered. Kal Tire is proud to recognize our retired team members who have dedicated at least 10 years of service to the company. Kal Tire offers eligible team members pricing discounts on tires, parts and labour for the retiree and their spouse’s vehicles. Our Tuition Exchange Program offers a unique opportunity to students in their post-secondary education. Eligible students collect an annual reimbursement during their education. In addition, this opportunity provides valuable working experience in a fast-paced, physically demanding environment. Our goal is to support students through their post-secondary education and to set them up for success. Kal Tire will pay $500 to team members who are instrumental in recruiting a new person to Kal Tire once the recruit completes their 90- day probationary period. An additional $1,000 will be paid when the new hire has earned their assistant manager or commercial sales certification for a total net income of $1,500.